This was Jerry's first hardbound collection and it contains some wonderful card magic. New plots, new methods, all with the distinctive Sadowitz flair for ingenuity. If you haven't read any of Jerry's material before, this book will convince you why Jerry is regarded as one of the most creative cardicians. The book opens with "Fetch", an animated card discovery which you will use as soon as you read it. Or what about "A Million to One" in which the spectator shuffles the deck and then cuts it into two piles, one contains all the red cards, the second contains all the black cards! Or if you really want to fry brains, try "The Backward Card Trick" - it looks very weird. There's a special section on pre-determined estimation - a devastating principle. It allows for genuinely impossible looking card locations, and no matter how well versed you are you'll be unable to reconstruct the method. Finally, Jerry presents Name a Card Triumph. With this you can produce any card named within seconds. 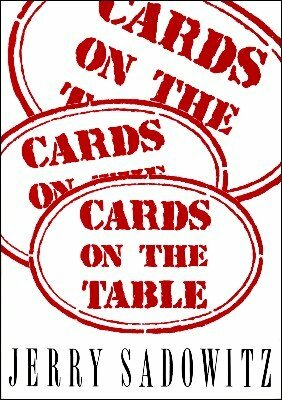 Cards on the Table contains 25 items in all, top class card magic by Jerry Sadowitz. 1st edition 1989; 2nd edition 2003 (105 pages).